Looking for a new bass pedal? Look no further. The search for the perfect bass pedal, y'know the one that feels like an extension of your foot rather than a lump of metal, can be a long, long road. There's a baffling amount of choice for starters. We're talking direct drive, chain, belt, single, double models from just about every manufacturer out there. Luckily we're here to help. 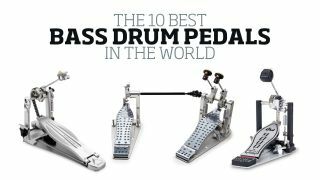 Here we have tapped Rhythm magazine's 30 years of extensive gear reviews to bring you the finest bass drum pedals in the world. Read on for our top ten, with links to full reviews of each and every one. A double pedal for less than 100 notes? Hats off to Gear4Music for producing a cheap-as-chips entry-level pedal that won't let you down in its performance. It looks like it was designed by a Formula One team and plays like a dream. DW's Machined Direct Drive pedal is a real technical feat, with a price tag to match. The G-Class isn't just beautiful to look at, it's also a strong performer that comes in at an eye-catching price. Its fluid, balanced action also means it is fantastically versatile. A labour of love from master drummer Jojo Mayer, the Perfect Balance pedal incorporates some of the calibration and balance qualities of pedals from earlier eras into a modern chassis. It's a case of evolution not revolution for the 5000 series, as this model delivers subtle but important tweaks like the Tri-Pivot foot clamp to this hugely popular range. Speed, accuracy and a smooth operation all helped make Pearl's Eliminator Demon Chain Drive pedals a roaring success. These models offer a chain system rather than the direct drive found on previous Demon pedals. First launched in 2010, the Falcon range saw Mapex combine pro specifications, user-friendliness and an innovative design. No wonder they have proved so popular. With a host of professional DW features, these direct drive pedals look great and are comfortable to play. Probably best suited to the mid-level player looking for an upgrade. DW's industry-standard 9000 series set the benchmark on its release. Constructed from aircraft-grade aluminium, the 9000 pedals are smooth as silk and superbly durable. Updating the legendary Iron Cobra must have been a daunting task for Tama, but it pulled it off with this beauty. Tama took the finer points of the Iron Cobra and added well-thought-out tweaks to its scene-stealing younger brother. Features like the Speed Spring, LiteSprocket and Super Spring make the Speed Cobra a joy to play and help it live up to the claim that if offers 'Extreme Velocity, Serious Power'.